Understand sentences and frequently used expressions regarding topics such as business, health, celebrations, etc. Communicate in simple and routine tasks requiring simple and direct exchange of information on familiar and routine matters. Describe clearly and in simple terms aspects of his/her background, immediate environment and matters in areas of immediate need. 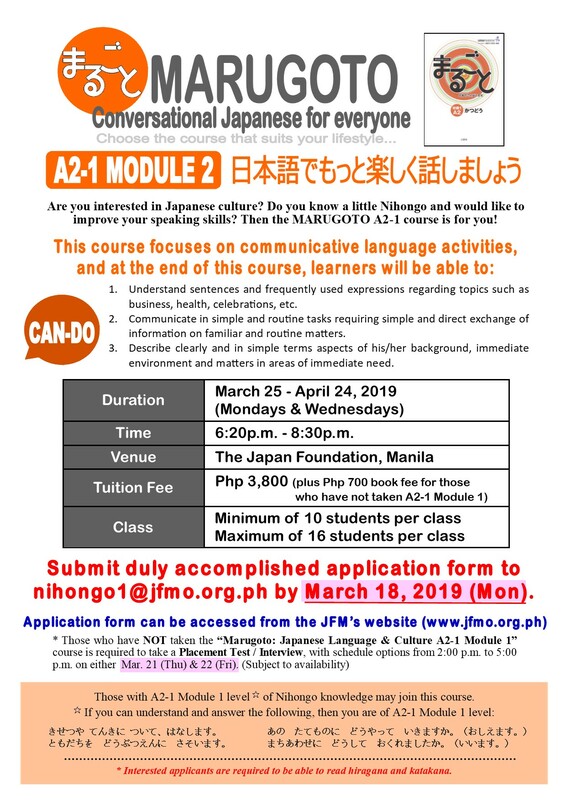 Submit duly accomplished application form to nihongo1@jfmo.org.ph on/before March 18, 2019 (Monday). 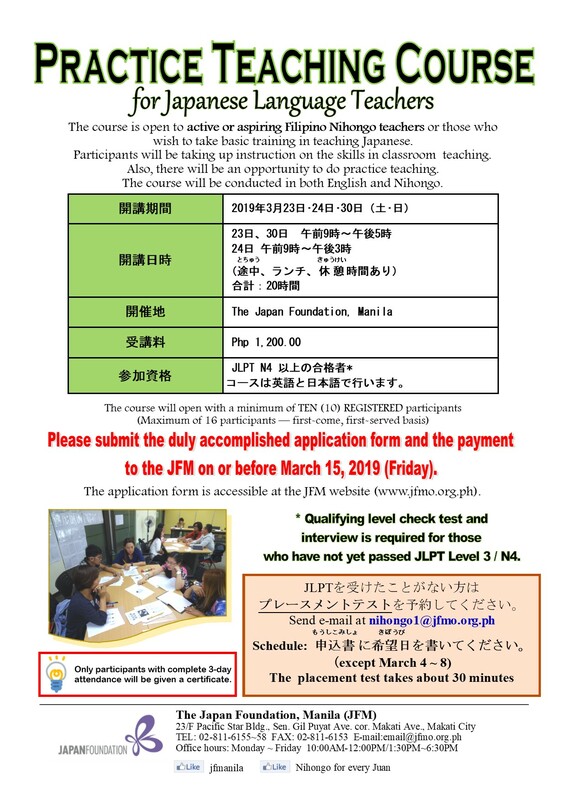 Please submit the duly accomplished application form and the payment to the JFM on or before March 15, 2019 (Friday). 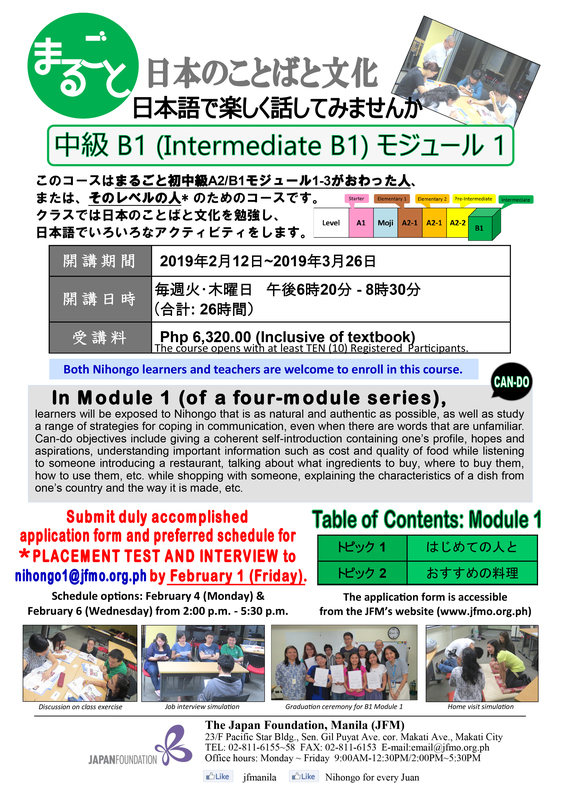 Available schedule: Any day between Feb. 26 – Mar. 14 (except weekends and Mar. 4~8) / Any time between 10:00AM – 6:00PM (except lunch time – 12:30-2:00PM). Please write down your preferred schedule in your application form. 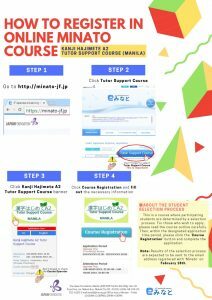 This is a fee-based tutor support course for those who are interested in kanji, or want to start learning kanji. This course has a Group noticeboard. 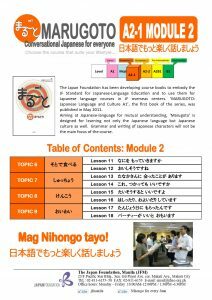 You can exchange information with your classmates and teacher regarding the kanji that you like, etc. 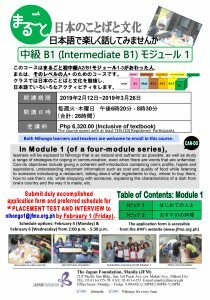 Eligibility ★For A2 students who can read and write Hiragana/Katakana, and who know the very basic level of Japanese. 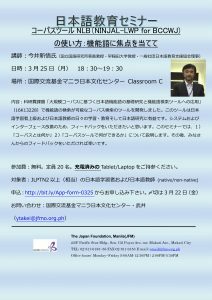 This course is for those who can come to the JFM. The maximum number of students for this course 20. Participants are determined by a selection process. 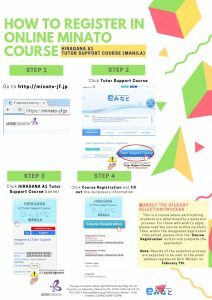 For those who wish to apply, please read the course outline carefully, and please click the “Course Registration” button and complete the application by 11:59 pm of February 17. 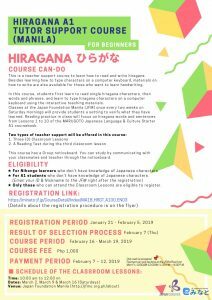 The results of the selection process are scheduled to be sent through email on February 18. 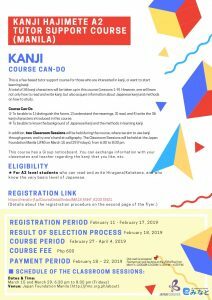 Please note that those who will not be selected will automatically be placed on a waitlist, of which the results will be sent through email by February 22. 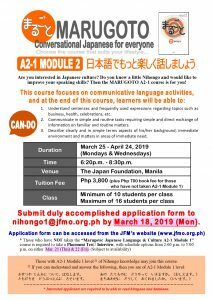 In Module 1 (of a four-module series), learners will be able to deal with a wide range of situations while taking sociolinguistic appropriateness, etc. into account. Can-do objectives include giving a coherent self-introduction containing one’s profile, hopes and aspirations, understanding important information such as cost and quality of food when listening to someone introducing a restaurant, talking about what ingredients to buy, where to buy them, how to use them, etc. while shopping with someone, explaining the characteristics of a dish from one’s country and the way it is made, etc. 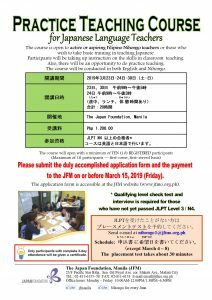 Submit duly accomplished application form and preferred schedule for the *PLACEMENT TEST AND INTERVIEW to nihongo1@jfmo.org.ph by February 1, 2019 (Friday). 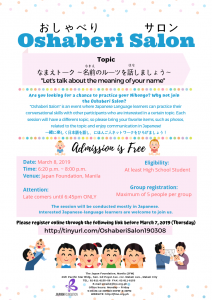 Available schedule: February 4 (Monday) and February 6 (Wednesday) from 2:00p.m. – 5:30p.m.